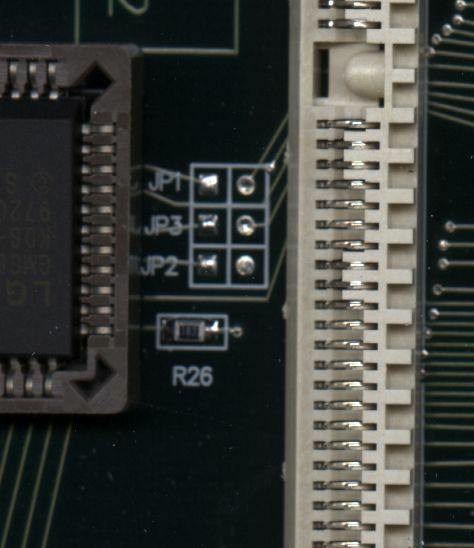 The WebPAL has two serial ports, provided by the SMC chip. One serial port is hooked to the 8051 microprocessor serial port and handles IR input from the IR keyboard and remote control. The second serial port can be used a console or general purpose serial port from Linux and also is the debugger port for the Webpal code. To use the secord serial port as a general purpose port, you need to do two things. Cut JP1. This jumper is labeled on the top of the board, but the trace that needs to be broken is on the bottom of the board. The photo at the right shows JP1. Its located near the SIMM sockets and the 8051 microcontroller chip near the front of the unit. Build some sort of RS-232-C adapter. The header JP10/JP11 has only TTL levels and they need to be converted to RS-232-C levels. The one I built is described below. I built a small PC board with a MAX232C chip on it to handle the conversion. It plugs into a 20 pin header that you can install on the Webpal PC board. 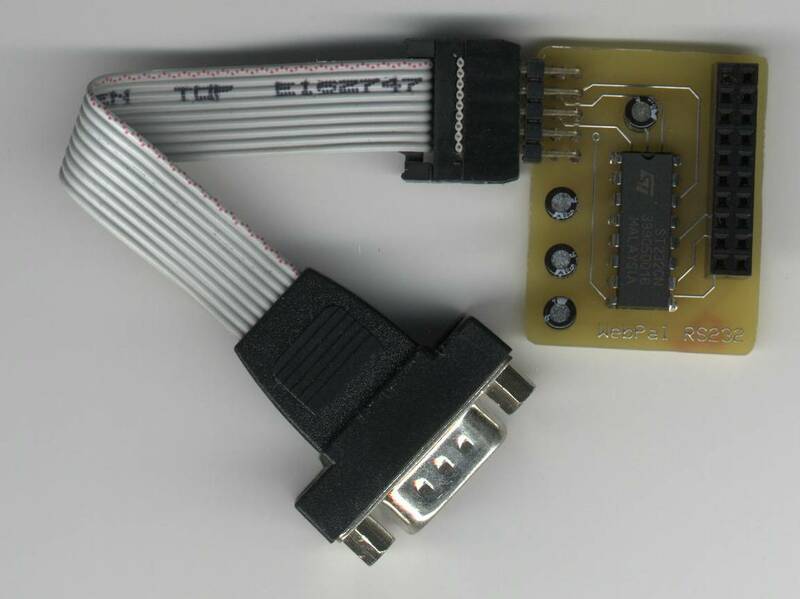 The output is a 10 pin header that can connect to a 10 Pin header to 9 PIN RS-232C adapter cable. Here is a picture of the board. Here is a schematic. I used the ExpressPCB service for this. They have a low cost service that will build 3 small boards for around $60. Since I can get 4 copies of the converter board on each of the small boards, you end up with 12 copies for $60. Here is the PC board file and also a PDF of the parts layout (showing 4 boards). Since this is a fairly simple circuit, one could hand wire it if you were only building one unit. Everything installs on the top of the board and then the board is plugged into a 20 pin header that is installed in J10/J11. I used a desoldering braid to remove the solder from the Webpal so I could install the 20 pin header in J10/J11. You really only need the 10 pins of J11 if you want to save time. To build the adapter board, install the 4 caps (+ goes to the square pad), the MAX232 chip, the 20 pin header receptacle and the 10 pin right angle header. You plug the 10 pin IDC to 9 pin RS232C cable into the right angle header (make sure you align pin 1 correctly). There are two versions of these IDC10 to DB9 adapters so make sure you get the DTK version. The link in the parts list above contains the pin out of the correct version as does the schematic. Turn the board over and plug it into the 20 pin header you installed on the Webpal board. You now have an RS-232-C port!